Bloodrose, you’ve broken my heart. But I can’t say why because I don’t want to give anything away. While I’m happy with the way this series has ended overall, I’m not entirely happy about some of the paths this book took to get to that ending. 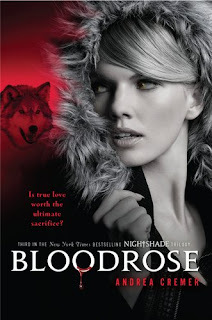 Now, even keeping that heartbreak in mind I’d have to say of the three books in this series, Bloodrose is my favorite. I don’t remember Nightshade very well, except a feeling of dislike towards Shay. Wolfsbane was very good, but this was the most fun book in the series. Cremer sends you on a quest with these characters, in which they’re retrieving the last three pieces of Shay’s Cross weapon. And boy let me tell you, Cremer is not afraid to do what needs to be done with her characters. So prepare yourself for some hard spots for these guys. The writing was done so well that I even felt like I was in those locations with everyone. The following sentence will be whited out for now since it is considered spoilerish. Please do not highlight the text if you do not want to be spoiled. You have been warned. In terms of the love triangle, there is of course a decision made, and was clear early on what that decision would be before Calla even did anything to really confirm it. This I will also not say because I don’t want to spoil that for anyone. It was nice seeing even more of the new characters from Wolfsbane. This book only cemented my love of Conner, Ethan, and Adne. I did miss Monroe, because even though he was only around for a little while, he did leave an impression. I have to say, honestly, the last battle was not quite what I thought it’d be. It just seemed a little less than what all the build-up throughout the book was pointing towards. Stuff happens, and believe me, depending on which team you’re on, you’ll probably be crying at one point. I know I did. I was shocked by that twist, though I guess it had to happen. Then once the final battle is won, there’s another twist. I wasn’t sure I liked how it ended at first, but after more thought I decided it was perfect. Though a little sad, since Shay recovers something, only to lose it minutes later. Seriously, Bloodrose is an explosive end to series that I’ve come to love. I felt truly sad when I realized that this was it. I’ve gotten to know these characters, so I’m sure I’ll reread these books many times to revisit them. I recommend this of course for fans of the series, but also just for fans of werewolves in general, whether you read YA or not. Andrea Cremer is an excellent writer, and I will read anything she writes in the future. you know, I’ve read a couple of BLOODROSE reviews and none of them ever seem to be happy with the love triangle decision. I wonder who it could be? ;)haha! Awesome review, I will be counting down the days til the release! So jealous you’ve read Bloodrose! I’m dying to read it – I need more Ren in my life!